The narrow glazed cobble stone roads and small alley ways between the most wonderfully painted and restored old buildings with their balconies and fine laced trellises was like stepping out of the Caribbean into Europe! I knew this was going to be fun! The photographic opportunities are huge! (you will unfortunately noticed the huge amount of pictures that I have difficulty with choosing what to post and what to leave out!!) 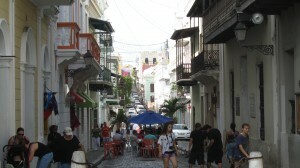 We could not wait to hit the streets… Old San Juan is on a peninsula … where the Forts were built to protect the waters and access to this big natural harbour. There are two fortes in Old San Juan and another smaller one just outside across at the other bay entrance on a small island. 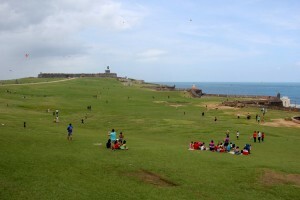 The biggest one and most impressive one is El Morro! I am not much of a Fort lover … but this one is mind-blowing! If ever you want to see an excellent Forte and very well preserved … go and see El Morro Castle … I know they call it a castle – but it really is a Fort! 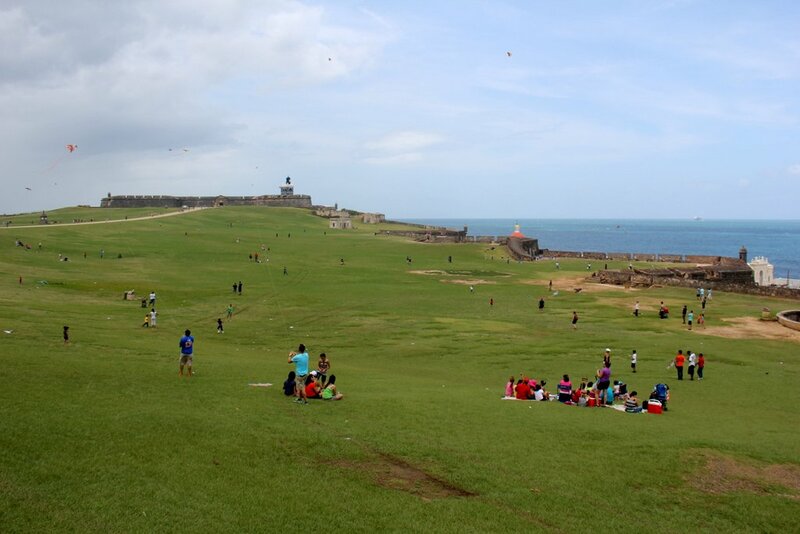 It is amazingly beautiful with this massive open space of a forever stretching lawn in front of it … where heaps of kids and adults are flying kites in the breeze and the awesome view from the bottom of this lawn covered hill up to El Morro was just breathtaking! The view (as the Captain has told me so many times before when I did not want to walk up any hill to see another Fort!) is just always wonderful! You could see the whole stretch of that side of San Juan with your eye automatically following the beautiful thick stone wall that was built all around the city!… that on it’s own has so much character… with the almost 400 year old lookout posts making it impossible not to feel like popping into them and get anyone passing by to take a picture of you! The town has a buzz to it that is hard to describe. 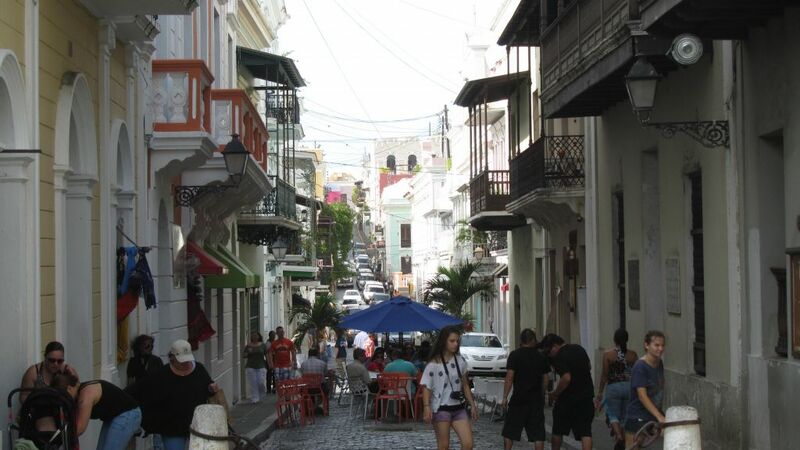 People seem to be unhurried… there is always some musical sounds coming from somewhere … the Puerto Ricans are beautiful people with their Spanish looks and lovely olive skins and black hair… but they are also very friendly! Restaurants and Food: We have tried to have small tapas meals at various places at night and the food varies from Puerto Rican (fantastic jalapeño’s stuffed with cheese and crab meat) to Spanish to Latino Asian (which is what we had at The Dragonfly … a combination of Latin American and Japanese/Chinese ! Just gorgeous …imagine Peking Duck Nachos with a Wasabi Mayo! !!) The Old Harbour Brewery has the most fantastic German food on it’s own or combined with Latino flavours and best beer taste (brewed there) we ever had! Then there was Restaurant Triana … where you have live Spanish music and nibbling at the pub at some aged prosciutto and cheese!! And the lovely vibrant Parrot Club! 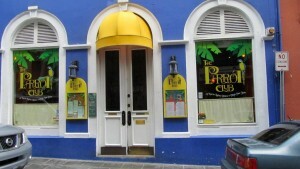 as well as Carlis … a French Cuisine restaurant with flare… like only the French can do! So many options! … we ran out of time in the end to do the full round of pub crawling and restaurant tasting! One night we decided to go for a walk after dinner …. Walking towards some really vibrant loud music (Spanish music it was) and found a stack of (80-100) locals having a sing-along night. Whoever had an instrument played along with the base band! There was one main (female) singer with a great voice and stage personality on the mike and 3 backup “girls” (just about 70-80 years old?) . Folk music! Just fantastic rhythm and so we swayed and clap along … I even joined in with the train dance!… it was so much fun! I was stunned by how eagre they are for one to take part and how many young people there was … young and old …all just for the sake of music and having fun !! It lasted until about 11pm … it was a great end to a special night for us! There surely is much to say for culture! Art and fine Arts are playing a fairly big role in the educational system here. Specific centres are found where kids have painting lessons (not only keeping them busy with a messy paint room! ), music and dance lessons and you see kids from 4-16 years old walking around with cello’s and violins in the streets … again …. It is just a part of culture that we sadly sometimes miss in our country?! 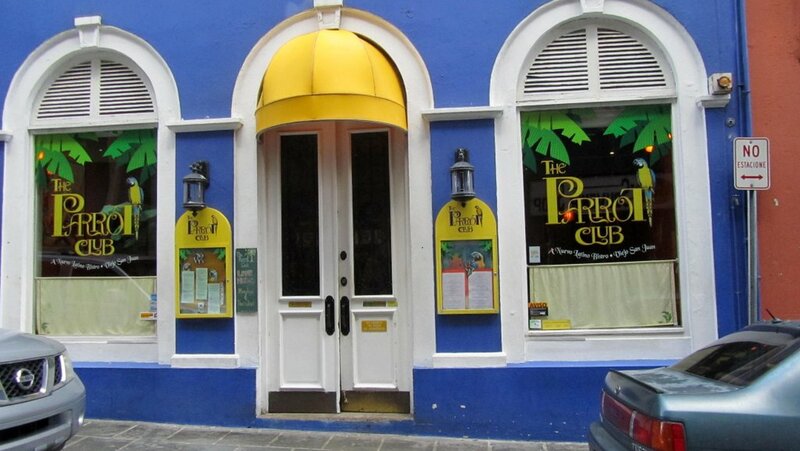 Old City San Juan … we will miss it …and hopefully one day we will have the time to go and taste some more of this wonderful old place! A must see … if ever you get that way …add it to your bucket list!